This page has a total of 13 images, as of 28.03.2019 (21:56:09). I felt this was another 'Had To Have' image, so bid accordingly, only to be quite sad when I got it as once again when it comes to photographs from this seller, they appear to be digital printed copies from another source, not real photos from back in time. This is a bad quality view up what I believe is First Street in Victor, towards mines on Battle Mountain, below the Strong Mine and below Victor Avenue which I believe is seem about 2/5 up from bottom about 1/3 in from right-hand side. The view is given the feel so many residences lived with every day, even if sadly the view itself is rather dark and not that sharp in its appearance, lot of fingermarks on the negative this came from. * The top of Strong Mine is seen about halfway top/bottom and about 1/3 in from right-hand side. The whitish tower sticks out in the scene, easy to spot. * Portland No. 2 Mine is seen against the sky behind and left of the Strong, also easy to spot, I think the No. 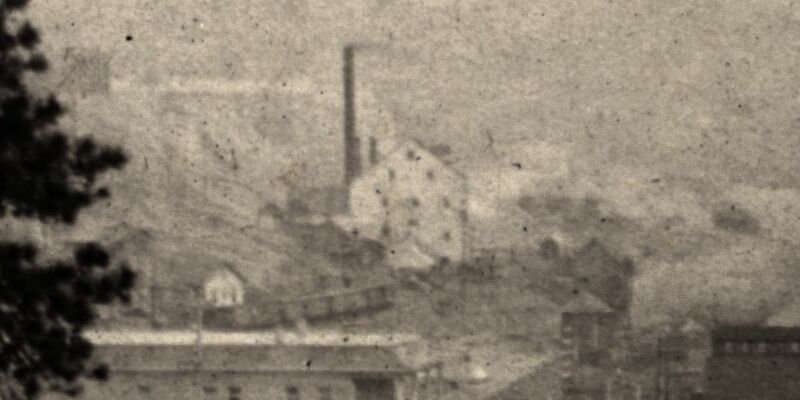 1 Portland is seen at 4 smokestacks poking up among the dumps seen below and left of the Portland No. 2 – seen about 3/7 in from right-hand side. * Dillon Mine, of the Granite Company, is seen about halfway up from bottom and nearly 2/5 in from left-hand side. Seen as a dark blob with white text on the side, against dumps and cribbing, above some houses. * Independence Mine is seen about middle top/down and about 1/17 in from right-hand side, easy to spot due to the many smokestacks almost making a single line. Other mines are also visible, but they are so hard to ID properly due to the low quality of the card, so I leave them out, but I see the smokestack of Ajax Mine near left-hand side against the sky, and further to the right the mine poking partly up from dumps might be the Granite or the Dead Pine, I can't tell from this view, so I leave it out. My Collection; Photographs. Enhanced version of my 300dpi scan. This overview of Victor as seen from somewhere in South-East has been credited to several photographs, Schedin & Lehman is written on an Image seen at DPL, where also Julia Skolas has her name, but as this view is from after the 1899 fire which took out much of Victor, but before the head-frame of the Gold Coin was covered sometime in 1900/1901 timeframe, I can't see how she can have actually have taken this photo, so I think she bought it and the rights to it – and possible others – from the Schedin & Lehman company after she arrived at the District. The usefulness of this image is really on the DPL view, as most of the mines are deep into the image and some of them are really not much to actually see anything other than knowing they are in this view in order to help place them in a mental map of the District/area. * In the foreground left is the mine I've seen a close-up off from the other side, where it then was marked as "Great Central Mining & Milling Co.", and from other sources I have it linked as being named/known as the Maggie Mine. * About middle bottom/top along the right-hand side is the top part of the Shaft-house of the Strong Mine, with the Victor High-School in front of it. * About 2/5 down from top and about center left/right is the large smokestack of the Gold Coin mine, with the Head-frame at right of the smokestack – best seen on the DPL large image. This helps date the image except I don't know the date the head-frame was enclosed in the brick structure most common known as the Gold Coin mine. * Above the smokestack of the Gold Coin, high up on Squaw Mtn. is a dump area seen, there is a small Shaft-house there, again I refer to the DPL as best view, that is the Nellie V. mine. * About 1/4 in from right-hand side, and about 1/3 down from top, is the large Ajax Mine complex seen, with the big dump out over the hillside of Battle Mountain. Looking at the DPL view one can actually see they are extending the Ore-house towards right in this view. * Just right of the Ajax is the upper shaft of the Dead Pine, located along the Golden Circle, they did as the Portland Mine did, they have a tunnel over the tracks of the Golden Circle narrow gauge line, except here it is made of wood, not steel as on the Portland property. Can't say it is on the view, I know it is there, seen as a dark spot between Ajax and Dead Pine, but it is too far away to be of any use at all. * Further to the right, just left of the massive Portland dumps, where the hill curves, there lays the Granite Mine, seen with its Shaft-house and power house, smokestack and all, albeit at a to large distance to be of any good use for a model work, it helps in determining where in the area it was located. * The Dillon Mine has actually two shafts seen in this view, again it is the DPL view that is really of any use to such image research, a slight distance left of the shaft-house of the Strong mine on the right-hand side, there is a small Head-frame and small hoist house seen on the hillside with a dump – that is located on the Dillon claim. Further up the hill, more hidden away due to distance and such, is the more commonly associated boxy type of Shaft-house of the Dillon seen where it lays just below the mainline of the M.T. climbing the hills towards the Portland mine area outside the view at right. Seen best on the DPL view at a 100% look, or try the 200% and go near right-hand corner, the only shaft-house in this area with lettering on the side of the structure. * Again, the DPL is of help to locate the Ore-house of the Mary Cashen Mine, as it is poking up among the roofs of Victor structures, about halfway between the Strong and the Gold Coin mines. * Also, on the DPL Image the Fortuna Mine is seen quite well in the 100% view, just where the word 'Skolas' is written about 2/5 up from bottom and about 1/3 in from right-hand side. Showing a small Head-Frame west of the Hoist & Power House, with what might have been the loo west of the head-frame or possible a shed for dynamite? My Collection; From page 17 in the 1904 Annual Edition of the Colorado State Journal. Page 17; Colorado State Journal; 1904 Annual Edition - Published in 1904. Page 76; Program of Trans-Mississippi Commercial Congress - Cripple Creek, Colorado, July 16, 17, 18, 19, 1901 - Published in 1901. I think this image is at the eastern end of Spicer Avenue, and that the mine seen with its Head-Frame behind the head of the rider in the foreground is the Fortuna Mine, but I might be off as this been hard to decode fully where it was photographed, might be even further south in Victor. In background top right, about 1/10 down from top and about 1/6 in from right-hand side there is seen a trestle type poking into the image, with an Ore-House further to the left, and this is belonging to the Independence Mine, and about same down from top but 1/3 in from right-hand side is the brick structure of the Victor High School seen blocking most of the view to the Shaft House of the Independence Mine. Even harder to see is the Strong Mine seen mention on the backside of this card where someone has really not known their town view very well as this is clearly not on neither Victor Avenue nor 7th Street… The Strong Mine upper part of the Shaft House with a small cupola or awning poking out of the roof can be seen behind the wood posts seen near upper left. About 1/6 in from left-hand side and about 1/7 down from the top that part can be plucked out due to the awning/cupola and the window+door+window part making sort of a face on the side facing the photographer – this makes it distinct and easy to pick out. Along the top left-half there is seen the massive dumps of the Portland Mines and part of the Crib-wall below the No. 2 Shaft is seen, so yes, the mines really set their feel on town. Based on the ending price on this card I can see I was too crazy for it, as the other fellow was more keen then I had imagined and I should have respected that one, but I feel for the need to have feel as I do feel this image is helpful to me to understand better how the railroads changed over the years as this view do show how the old narrow gauge yard of the F. & C.C. has three lines of standard gauge tracks on them, filling in some blanks I have got after some other views from further west, looking more like southernly while this view is more westerly. Sadly, the left side of this view is more blurred then the rest, seen very easily on the higher resolution scans. I can see there are some railroad spurs there, and it looks like there is only a road surface on Diamond Avenue which dates this to be after the street track of the Trolley was ripped out, otherwise I should have been able to get a glimpse of tracks on left-hand edge about 1/3 up from bottom left. The Strong Mine is easily seen with its exposed Head frame and Ore-House in the foreground right, showing mine tracks crossing the Midland Terminal between the Head-Frame and the Ore-House. In the background, high up on Squaw Mountain is seen the dump of the Nellie V. Mine, about 1/8 down from top, while the huge dumps to the upper right belongs to the massive operations at the Ajax Mine. This view of Victor is looking north from Straub Mountain area. Photographed in 1911 by the Hileman as the view is credited to. Being this is from a printed card in a small more modern postcard folder it is not the greatest quality, but one gets an idea of the town and the many mines in and around it. In addition, in this view they are marked out, even if there is at least one error in that marking. * In upper left quadrangle is the Portland No. 1 & No. 2 marked out, but the location of the No. 2 shaft of the Portland is NOT where this image gives it! Portland No. 2 shaft is in this view above the No. 1 shaft, seen a little left of the center of this view sideways. No. 2 Shaft of Portland is seen against the sky with No. 1 just below it, with the huge dumps where No.1 is written. The Granite, original shaft, is located where this card has written the No.2 text. * Just behind and left of the huge smokestack of the Gold Coin shaft, marked in this view as Granite, is the main shaft of the Dead Pine. The dump is much easier seen then the mine itself. 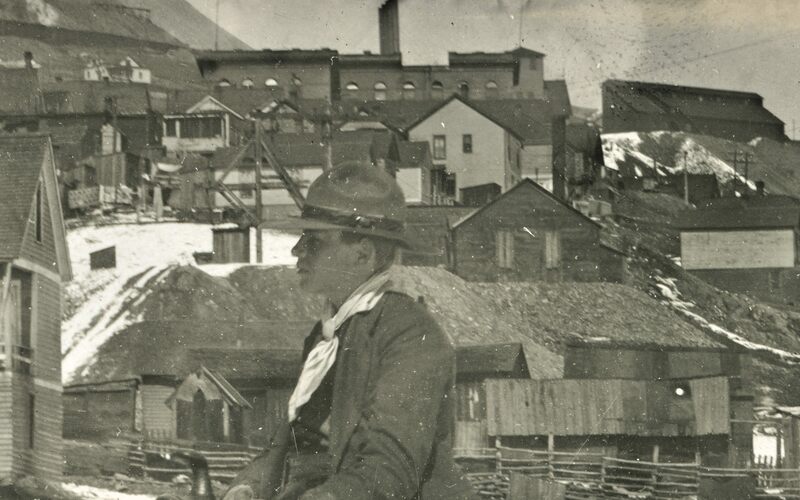 Postcard; Unknown Publisher; titled Victor, Colorado - "The City of Mines" (Early 1900's) - Published in ????. #11-9; Victor, Colorado - "The City Of Mines"
This view of Victor is looking north from Straub Mountain area. 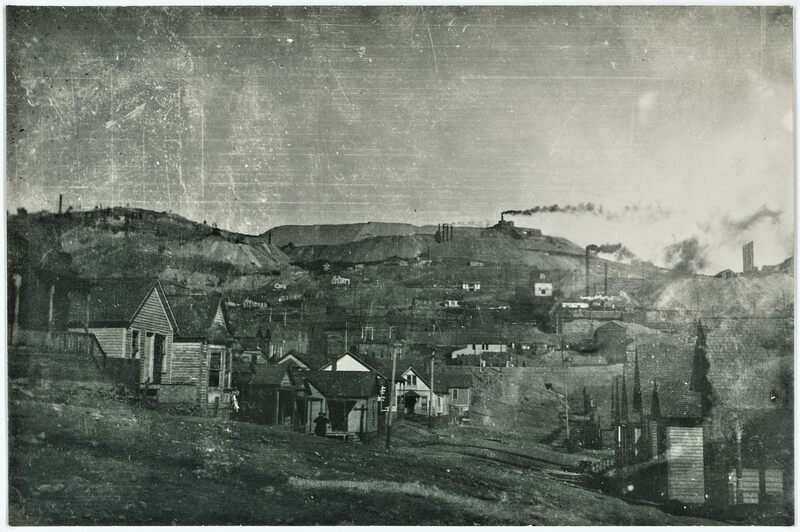 Photographed in 1909 by the H. & H. Studio in Cripple Creek, it was taken by either Hileman or Hill, impossible to tell for sure as the view is credited to them both. Being this is from a printed card in a small more modern postcard folder it is not the greatest quality, but one gets an idea of the town and the many mines in and around it. * Gold Coin, here marked as Granite Mine on the south facing ore-house, is seen about middle top/down and about 1/5 in from left-hand side. * Just behind the huge smokestack of the Gold Coin is the main shaft of the Dead Pine, named Oliver Shaft for some reason. The dump is much easier seen then the mine itself. * Straight up from the Gold Coin smokestack, in the distance; against the sky; sticking up from the hill, is the shaft-house of the American Eagle. * The Ajax Mine is about 1/4 down from top left, about 1/6 on from left-hand side. * Further to the right of the Ajax would been upper shaft of the Dead Pine, the Granite (original shaft/mine) – seen about 1/3 in from left-hand side – and the Burns (main) shaft of the Portland mines, with the Portland No. 2 seen just off to the right for the center of the upper quarter in this view. * Towards the right-hand side is seen the Strong Mine, about half top/down and 2/3 in from the left-hand side. * The Independence Mine is just right of the Strong mine, seen with its huge dumps and structures. * The Vindicator Mine, shaft 1, is seen above the Independence mine, about 1/3 down from top. Postcard; Unknown Publisher; titled Victor, Colorado - "The City Of Mines" - Published in ????. My Website: ⊞ Postcards Overview; Victor, Colorado - "The City Of Mines"
This view of the Strong Mine is quite a good one to tell how it looked sometime in 1909 when T.J. Hileman took the photo which was the base for this postcard view presented here. Down left is the yard of the F. & C.C. railroad, while the mainline of the Victor branch of the M.T. is shown entering the scene along the right-hand side, where there is also a side-spur for delivering coal to the powerplant of the Strong Mine for their operations, seen here with a single M.T, boxcar (no. 211) parked on the trestle, while the mainline where passenger trains was running is this side of that trestle, dropping downgrade to reach the Depot not seen in this view due to be behind the Strong Mine Ore-house. Just behind the before mention ore-house is the Ore-house and headframe of the Mary Cashen Mine seen, with dumps around it and some of their cribbing's is seen behind the big truss bridge coming out of the Strong Mine Ore-House, extending across the F. & C.C. yard unto another smaller bridge and taking it to a rock-house outside this view which delivered dump ore to Short Line cars to be used as ballast, fill-mass and similar along the lines, from what I have understood it as. Up near right top corner the dumps and Shaft House of the Ajax Mine is seen poking up into the sky, and about center left-right and about 1/5 down from top, there is the dump of the Nellie V. Mine with a smaller two-post Head Frame and a hoist house and shed together as a long structure from what I can gather in a high dpi scan of this view. This do not match what Sanborn 1908 say the Nellie V. mine was to look like, as that say it is a shaft house type of structure. I wonder if I see the Columbine Tunnel or if it is another one which is seen a distance to the left of the extension of Diamond Avenue up to the M.T. tracks in the higher dpi scans. Seen about 1/5 in from the left-hand side and 2/5 down from the top, a dump is there in addition to a tunnel portal and some sheds to the left of the adit opening. My Collection; Postcards [Crop Version 2]. Postcard; Unknown Publisher; titled Strong Mine Photo By Hileman, C.C. 09 [crop version 2] - Published in ????. Postcard; Unknown Publisher; titled Strong Mine Photo By Hileman, C.C. 09 [crop version 1] - Published in ????. Victor Colo. From Independence Shaft House. This view of an early Victor town, taken from the Independence Shaft House, shows quite a large shaft house of the Strong Mine up front where it lays on Battle Mountain. There has been done some grading for the soon to come F. & C.C. railroad below the mine, and further west, as there is a fill seen just west of, or at the spot, where the Victor Depot was to come. Further west, near the right-hand side, there is a cut seen and the street in front of that cut is to be known as 4th Street and the future site of the Gold Coin operations. Sanborn for 1894 (December) shows the St. James Hotel here, and I think that is what I read on the full view seen at the DPL link for the structure seen at right of the cut. All this make this an early 1894 photograph due to the grading done for the railroad. Possible around March, or April, but before end of May as by the 25th of May the Strong Mine is blown to pieces to set an example during Labor conflicts in the District. My Collection; Cropped away the cardboard frame, and enhanced it a little as it was somewhat faded. Page 257; Florence & Cripple Creek Railroad - Forty Miles to Fortune; Allan C. Lewis - Published in 2002. TERMINUS of the Carlton Drainage Tunnel under Portland No. 2 Shaft. Other famous producers on Battle Mountain, Cripple Creek Mining District. This is an overview of some of the famous mines, making Victor, Colorado, ''The City of Mines''. Battle Mountain where some of the mines are nicely marked out. The strong Mine is seen just below middle top/down and just left of the Word ''AJAX'' on the left side of this view. The Independence is see sort of in the foreground with massive dump piles extending towards the photographer, while the Portland mines dumps fill the upper part of Battle Mountain on the top right part of the view. Town of Victor is partly seen in lower left, while the Ajax Mine is nicely marked out but still hiding behind some pretty massive big dumps on the upper left part of this view. My Collection; From page 21 in the 1941 Annual Report of the Golden Cycle Corporation; from a 300dpi scan. Page 21; The Golden Cycle Corporation: Annual Report to Stockholders - December 31, 1941 - Published in 1942. Page 22; The Golden Cycle Corporation: Annual Report to Stockholders - December 31, 1939 - Published in 1939. This view of the town of Victor is taken from Squaw Mountain looking east, southeast. It is an interesting view due to many reasons, please check out the 100% view on the DPL site if your curious, as that is a good one to see. About middle up on the far left you see the massive Shaft House of the Strong Mine and just of center to the right you have the massive Gold Coin Mine complex. In the lower left corner, there is an interesting and fun thing to observe, one actually get to see the entrance to a Trolley tunnel under a dump along the original Trolley roadbed into Victor, as marked on one of the earlier Sanborn maps, but not showing any rails on the Sanborn map, I am uncertain if there are any on this photo. Page 23; Gold Fields of Cripple Creek - Pan American Expo 1901; The Woods Investment Company - Published in 1901. Lot of people posing for a photo at the ruins of the Strong Mine after it got blown up during the Miners' Strike of 1894. Among all the men there is even a woman, probably with her man holding her hand, standing on the ruin of a boiler near right-hand side. Strange to look how barren Battle Mountain appears in this view, same with Squaw Mountain in background left, not long after this happen the hills was crawled all over with railroad, buildings, mines, prospects, and of course clearing away of trees. Page 223; Florence & Cripple Creek Railroad - Forty Miles to Fortune; Allan C. Lewis - Published in 2002. This view of Victor, from just above the M.T. spur down to Victor depot, on Squaw Mountain, is a nice one as it is dated and hence help show how for instance the Gold Coin looked in July 1901, as when the photographer R.I. Dabb of Le Mars, Iowa, took it on the 25th. * Sadly, it is quite faded in the background, but to the left of the Gold Coin is the quite large and bulky shaft house of the Strong mine seen in the distance, and that is of help to date views of the Strong mine as well, making this an important view, even if the Strong mine itself is not that easy to see details on. * The Gold Coin looks fully put up in bricks, all roofs and walls are there, the ore-house looks very narrow in its width when compared to the engine-house, boiler-house of the Gold Coin, but almost same width as the shaft-house. The roadbed of the F. & C.C. is coming through further downhill, and passing by the Gold Coin with two sidings branching of outside the ore-house, before curving out of view behind the mine. Here is a view of the western side of the old Gold Coin Mine, the one that burned in 1899. The ore-house is marked as "The Gold Coin M. & L. Co.", and while the southernmost part of the ore-house is missing in the view, I still have a pretty nice look at the old wood built mine. This particular view came with a hefty price-tag but such is life. There is also a hoist house and head frame in front of the Gold Coin crib-wall but I am not able to identify which mine at this point in time [21.02.2017]. Seen sort of as an extension to the shaft house of the Gold Coin in a line towards the photographer. To the left of the Gold Coin mine is seen the smaller shaft house and structures of the Strong mine, appearing below the dump of the Independence mine which is seen at about middle top/down at the left-hand side. Below the Independence, still on the left-hand side, there is another small mine operation of unknown mine to me, with a whitish house seen closer to the Independence, sticking out on the right side of the unknown small mine operation. 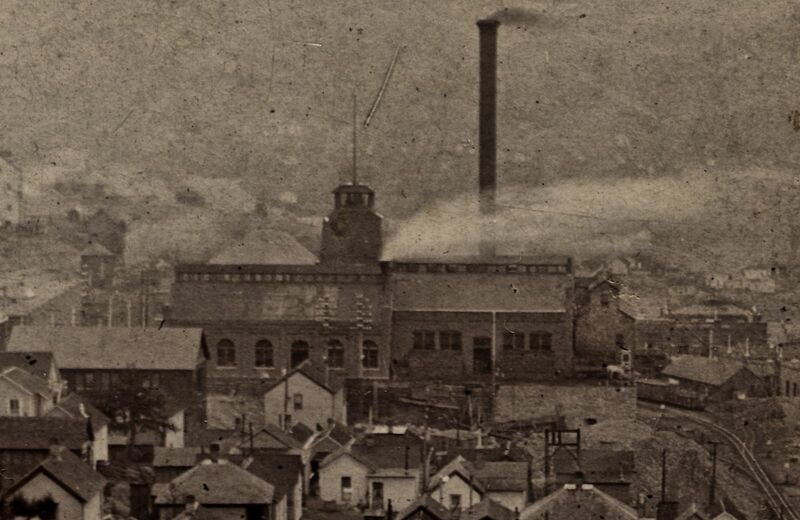 Near left-hand side, about 1/3 up from bottom, is the Victor Public Sampler structure seen, has a cupola on its roof, and smoke is coming out of a went near end of the roof at right. In addition to all this, there are homes, houses, even a tent home built high up on some log walls seen in this view.